There is an old saying that goes something along the lines of “that which doesn’t break you makes you stronger”. There are many other such adages that tell of the positives that come from adversity, but if the truth be known, more often than not, life would be easier and happier if the dark and dire were never traversed in the first place! But our human existence is not like this … it’s full of the challenges of hardship and the subsequent victories that come from climbing the mountain and starting again. The story of adversity and unexpected blessings that come from endurance is certainly one well known to Queensland couple Alanna and Richard Jaffray. 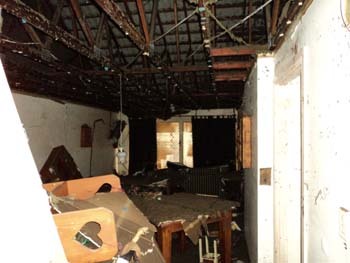 The Jaffrays lost almost everything – quite literally – in the floods of January 2011. 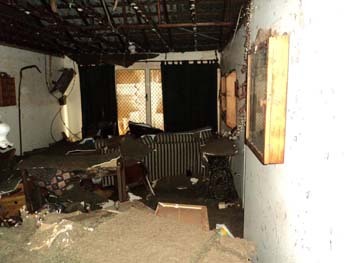 The only things that remained were the frame of their contemporary villa and a few personal possessions they had either managed to escape with as the waters rose, or they found in the debris as the flooding waters subsided. On the fateful day that the merciless waters came, they filled the Jaffray’s home from the ground, up the walls, to the ceiling … finishing level with the second capping of the skylight. Ultimately the waters rose a total of 19 metres in this usually quiet and tranquil pocket of southeast Queensland. 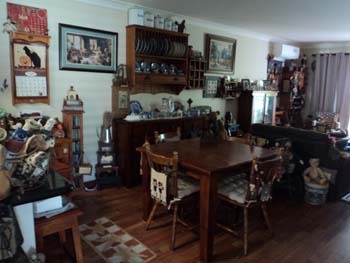 The floods destroyed the dream home that had taken Alanna and Richard a total of seventeen years to create, a home that was filled with much-cherished possessions, collectables and memories. As the couple sat in the pouring rain – on a rise in a park much further up the street – all they could see of their beloved country home as it disappeared under the ravaging waters were the tiles on the roof. Everything else was submerged. As Alanna tells, the process of creating an American Colonial home within a modern villa had initially been a challenge in and of itself. 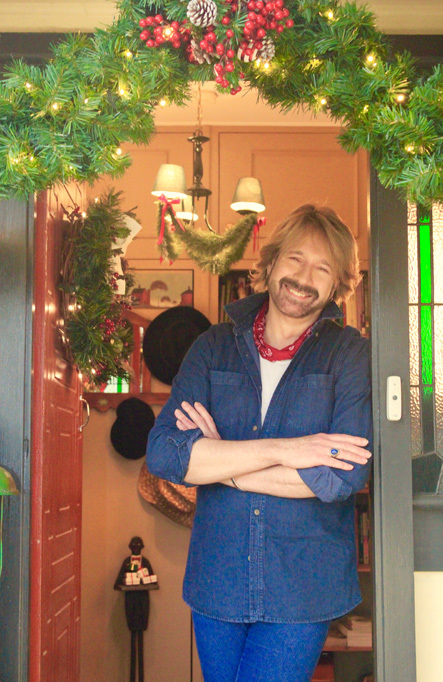 “We have both always loved the rustic, primitive feel of early America and had worked for many years to find the right pieces to create the style and feel of another time and place within the shell of a modern dwelling. 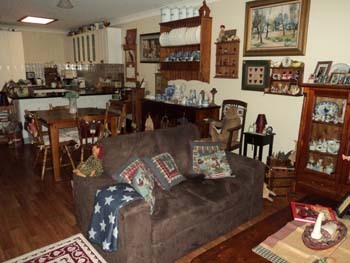 Richard and I had painted and decorated, we’d done over the kitchen and bathroom and added timber flooring throughout. 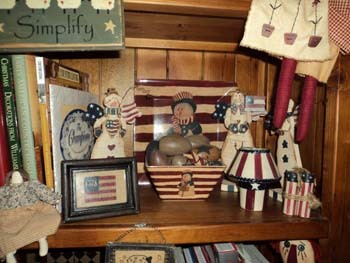 We’d papered and stencilled and collected from all over the place, incorporating both new and vintage pieces to create what everyone would tell us was a little piece of American country heaven here in Australia. And then it was gone … under metres and metres of water” Alanna tells. Alanna and Richard Jaffray both confirm that the floods of early 2011 were one of the most devastating experiences of their lives. And yet, looking back on the horror of those January days, the couple can now identify that there have been many blessings that have come from enduring such a horrific occurrence. “Although we were fully insured, the insurance company deemed that the incident was caused by the regional dam being opened and not by natural flood, and therefore they would not cover all that we lost” Richard explains. And so, with no home and the loss of almost everything they owned, the Jaffrays had no choice but to start again. This is truly where the love and support of those around them came to the fore … many people who offered help being total strangers, whose hearts had been so deeply touched by the plight of others in need. “From the very first heart-breaking day we returned when the waters subsided – to see our worldly possessions scattered everywhere and covered in stinking mud – we had the help and support of so many kindred souls” Alanna tells. From charity organisations to work colleagues, from family to special friends and total strangers alike, they all ultimately made a major contribution to getting the Jaffrays back on their feet, and back into their beloved home. “Initially, we were offered accommodation to get us through, for which we were so very grateful, The only problem was that it was at Bribie Island, 200 kilometres away. And so the serious travelling began as we would come back after work and every day off to tackle the arduous task of reclaiming our home, and our lives. The entire structure had to be stripped back to the basic timber framework and concrete footings. At this stage we had no shower, no tiles, no toilet and no electricity to work with. We started by salvaging as many of our possessions as we possibly could, washing them time and again to remove the layers and layers of intrusive mud and silt. Many things we thought would be ruined forever actually came back to life after they had dried out, including our dining room setting. Today, the slight warping and scarring is testament to the fact that they survived, and how we have endured. 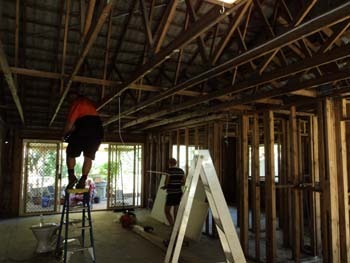 “The amazing thing about the process of restoration was the endless stream of people who came and helped for nothing – from the Salvation Army who donated items to get us through, to the dear friends who took up donations; from the businesses who donated practical things like gyprock for the walls and other building materials, to the companies who allowed us to purchase goods and held them in storage – free of charge – until we were ready to move back into our home” Alanna tells. Every electrical appliance in the home had to be replaced, as well as all the practical household items such as beds, and all kitchen and bathroom cabinetry. 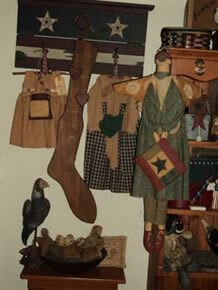 Anything made of paper and fabric was lost, including most memorabilia, clothing, floor rugs, bedding and the like. Only the few items the couple managed to get out of the home before the waters rose had been rescued. 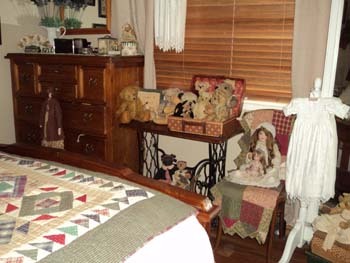 Thankfully, this included precious photo albums, a small array of patched quilts from America, collectable teddies and several much-loved antique sewing machines as well as Richard’s computer and an array of stackable American display boxes which the couple used to fill with small items during their time of hasty, panic-filled retreat. “We had four hours to fill our two cars before the waters came” Richard tells. “Everything was done in a state of sheer panic and we really didn’t know what we had rescued until we finally unpacked and sorted through what we had. 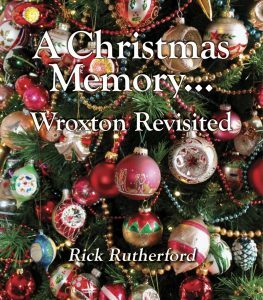 In the mad rush, as the waters rose in the street outside, we even managed – amazingly – to save some precious Christmas decorations, though neither of us ever remember packing them! We left the home at 8pm and by 1am on January 11th the entire place was completely submerged” Richard recalls with sadness. But through such pain and adversity, both Richard and Alanna testify that there have been many positives. They both admit however, during the time of ‘water invasion’ and subsequently the process of restoration, they never thought they would come to such a place. 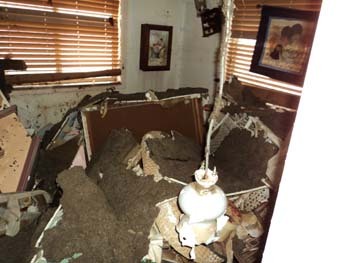 Both Alanna and Richard do confess that, if it had not been for the care and compassion, the endless love and the support of so many loved ones they would have walked away from their flooded, decimated home and never looked back. But now, over two years down the track, they are pleased that they stayed focused, and stayed strong. Not only are they now able to count the blessings of the many levels of relationship around them which have sustained them and carried them through – not to mention the bonds of marriage which have been made all the more strong as a consequence of the times and tests they have endured – the Jaffrays now have a brand new country home which they have grown to love even more than the former. 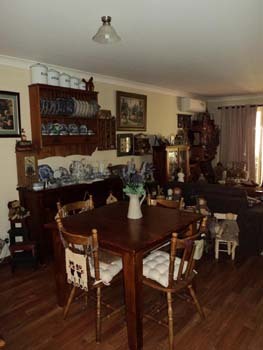 The lounge room alone is now nothing like it was. 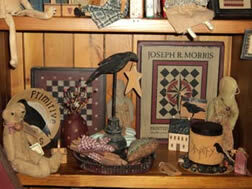 Furnishing pieces that survived the flood have been cleaned, waxed and polished. 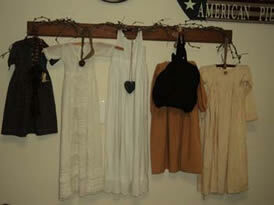 Other items have been bought new or rescued from vintage stores and antique shops. The new gyprock paneling has been painted a light mustard, with a feature wall in a deep mocha to reflect the warmth and tones of the many timber furnishings arrayed here. The lounge suite was given to the couple as a gift. 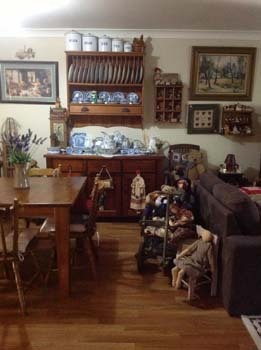 The Singer sewing cabinet was rescued prior to the flood. 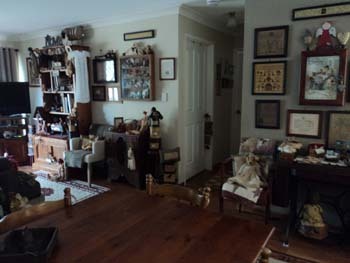 Sue Hay – doyen of country style in Queensland and great friend who spent many hours here washing china and furnishings – gave the couple a marvellous timber display cabinet as well as many other furnishings. Stitcheries, folk art pieces and framed images were also given by Sue as well as by various other friends and special supporters. 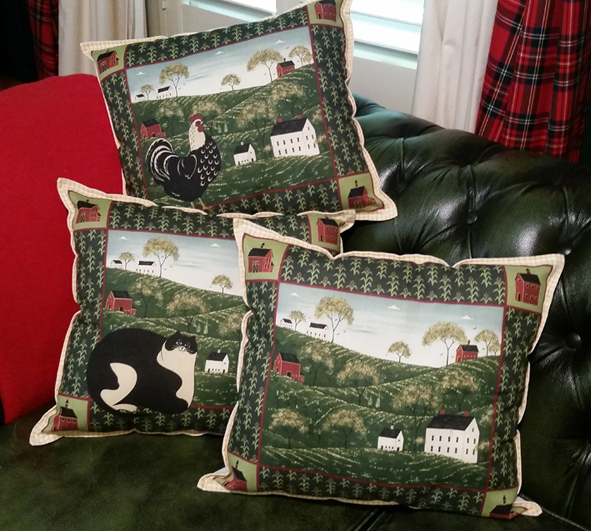 Gorgeous country cushions were donated by Sally and her mother Janette from ‘Gotta Be Country’. 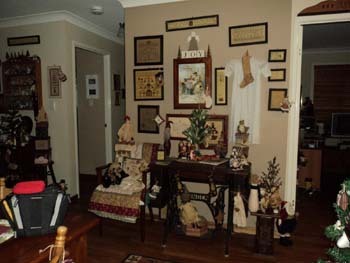 Fabric dolls – which went through the flood and were washed and redressed – now take pride of place, as do the wonderful framed primitive calendar images which Sue Hay had specially framed for the Jaffrays. 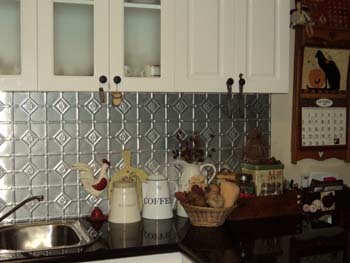 The open plan lounge and living area also incorporates the kitchen which has been made new with a special pressed metal splashback … a treatment the couple actually prefer to the former tiled finish. 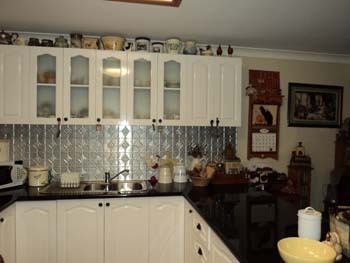 Two-pack gloss-finished white kitchen cabinetry and granite benchtops help to create the crisp, clean feel in the cookroom area and act as the perfect foil for the display of collectables and china. 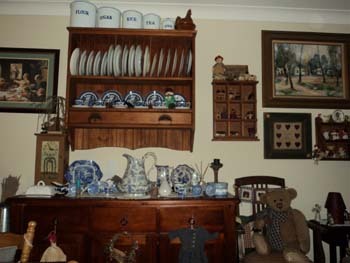 The china in particular is especially cherished as it was saved during the flood by the ceiling insulation. As Richard explains “the ceiling insulation fell down from above and into the china, anchoring it and preventing it from floating away as the waters ultimately subsided. 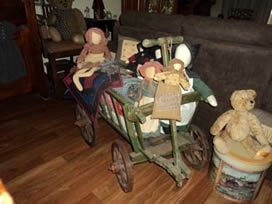 It’s yet another of the rescued treasures that we thought we had lost forever and are so grateful to have preserved”. 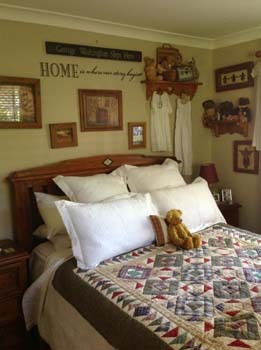 In the main bedroom, the brand new bed ensemble – given to the Jaffrays as a special gift by an anonymous donor who belonged to a local gym – is dressed with an American patchwork quilt which formerly provided emergency packaging when the floods came and the couple made their escape. On the wall above is a stencilled motto – now very much the couple’s personal mantra – which was provided by dear friend Sue Hay. 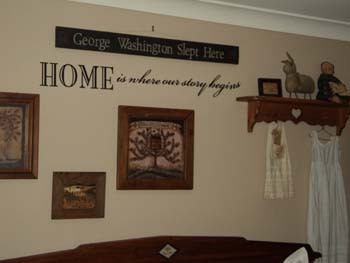 It reads “Home is where our story begins.” All the wall images in the room are new, with the exception of the George Washington verse high above the bed which Richard painstakingly repaired as it holds great sentimental value for the couple. 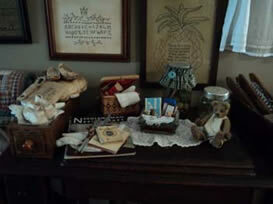 Prairie bonnets and christening outfits are a new collecting interest and signify a fresh addition to the room, as well as embodying the idea of new beginnings for the pair. 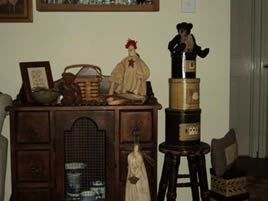 Pride of place is a much-cherished doll which the couple raced back into the home to rescue on the day the waters came. So many of the furnishings both here and in other parts of the house were meticulously re-crafted by Sue Hay’s beloved father who endlessly toiled … putting legs back on cabinets, shelves and panelling back on bookcases, and generally rescuing, refurbishing and restoring so many other pieces of the Jaffray’s original furniture collection. 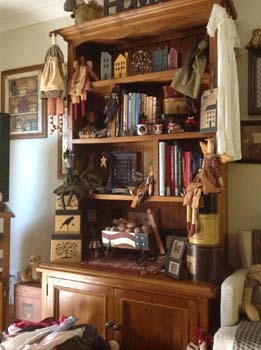 Asked why the couple have such a passion for the primitive American Colonial and folk look, they state they have always loved the fact that the style grew out of adversity as the early American settlers, centuries ago, utilised everything they had at hand to provide the most basic of life’s domestic furnishings and comforts. 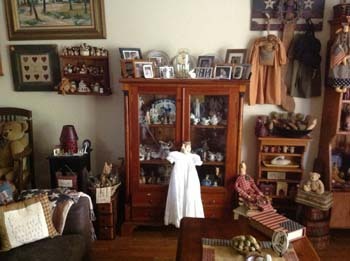 Materials were used and re-used within the home to create everything from furnishings to flooring, window coverings to quilts and an endless retinue of household wares. 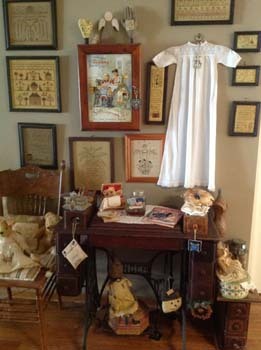 Thus all objects within the home had meaning and history … just as everything within the Jaffray’s country home now embodies a tale of survival, endurance and love. Like the quintessential trappings of the American Colonial look which evoke memories and speak of endurance and the passing of time, so too the elements – both individually and corporately – which make up the wonderful abode that Richard and Alanna Jaffray have so courageously reclaimed. Today, over two years since the flood, the restoration process continues … though now at a much quieter and more relaxed pace. The latest undertaking for the Jaffrays has been the final re-claiming of the garden and the creation of an outdoor relaxation area just beyond the main indoor living room. As time has moved on and memories have healed, the Jaffrays believe their country home now looks better than it ever did, and certainly embodies the love, care and attention of so many hearts who have contributed so richly to the task of restitution. 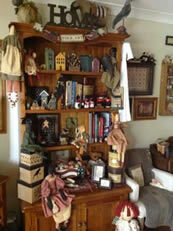 “Our country home is a testament to not only our love but also that of so many others” states Alanna. “How could we ever leave it?” she questions. It seems that, for now, there is no such question to ask as this delightful Queensland couple daily get on with the task of living their lives within a place that has – as a consequence of much hardship, adversity, and the mastering of such things – come to mean so much more than just a place to inhabit. This is now truly a place where hearts combine … a place to really call home.